Later topic: PLAGIARISM LIVES. U.K. I have a Hamilton Type Cabinet full of metal type that I’m thinking of selling and was wondering if anyone has any idea of what would be a reasonable asking price? It’s a 20 drawer chest, about 4.5ft tall. The outside has been repainted (same color) since the photo was taken. Every drawer has type in it (all small point sizes that aren’t organized by letter). 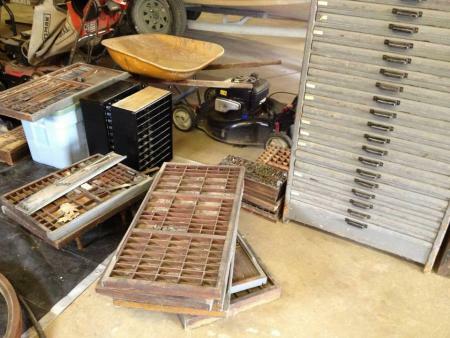 It came with my letterpress, but I don’t have the time or energy to sort the trays. The cabinet itself is in okay shape, but has a bit of wear and is wobbly due to age. 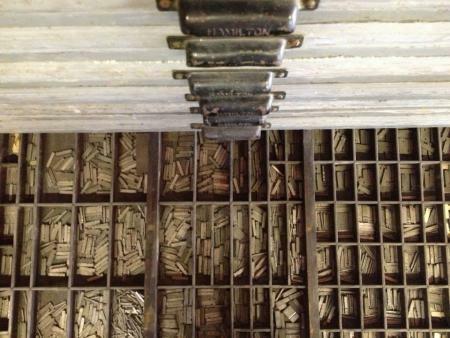 All the type is in great shape, just a bit dirty from sitting unused for probably 30 years. Sorry if this isn’t the right place to post, I’m just not sure where to start.